So, did iOS 10.2 fix the battery life drain problem which many were having on iOS 10.1.1? The following video comparison helps answer that question. Whenever Apple releases a new device, or a new version of iOS, there is inevitably going to be the chatter about how that device or software performs, and if it can actually offer the same type of experience provided by its predecessor. That may be the next iPhone to launch, or the newest version of the underlying operating system that powers it. With iOS 10.2 now available to the public, device owners are starting to wonder if the upgrade is worth the time, and of course, if Apple has introduced any battery performance improvements with this latest iOS release. 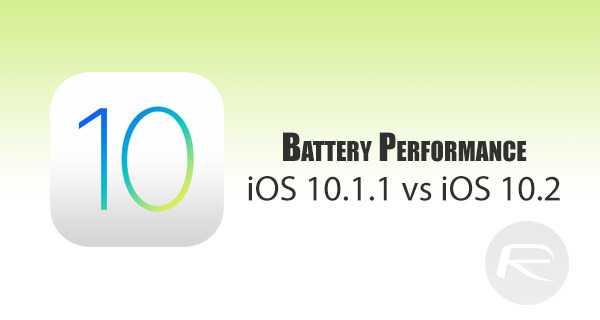 To be honest, Apple has been taking a lot of criticism recently about battery life and battery performance on some of its devices, especially considering it has recently acknowledged that a batch of iPhone 6s devices have been suffering from shutting down and detrimental performance, as well as the fact that the company has also publicly acknowledged an iOS 10.1.1 battery drain issue. With all of those things in mind, does iOS 10.2 offer a better battery experience over iOS 10.1.1? One of the first interesting things to note here is that the individual who is testing the battery life here on iOS 10.2 and iOS 10.1.1 had previously performed the same process on iOS 10.0.1 and iOS 9.3.5. That test resulted in a length of 4 hours and 58 minutes being achieved on iOS 9.3.5, and 5 hours and 17 minutes on the same iPhone 6s running iOS 10.0.1. That immediately shows that Apple had indeed made improvements with the jump from iOS 9 to iOS 10. In the fresh test conducted as shown in the video below, the iPhone 6s running iOS 10.1.1 managed to stay alive for 5 hours and 22 minutes, with the same device on the latest iOS 10.2 achieving 5 hours and 24 minutes, making iOS 10.2-running iPhone 6s lasting more than iOS 9.3.5, iOS 10.0.1 and iOS 10.1.1. Based on these tests, while iOS 10.2 shows marginal improvement over iOS 10.1.1 when it comes to battery life, it doesn’t seem like it fixes the battery issues on iOS 10.1.1 given the marginal improvement. Your mileage may of course vary. Check out the video for yourself if you actually want to see the proof of the pudding. Performance Wise, Is iOS 10.2 Worth Upgrading Over iOS 10.1.1? Public beta iOS 10.2.1 is out. Not the most scientific test. They are two different phones with different batteries. Who knows how many cycles each of them has been through. Even two brand new batteries will not perform 100% identical. I’m actually impressed the two we so close in perf in this test. But watching this video reminds me that I need to charge my iPhone 7. I forgot to charge it two nights in a row.